On January 28th, 2015 Kyrie Irving made 11 3-pointers against the Portland Trailblazers. His 55 points helped the Cavs to a 99-94 victory in Cleveland. At only 22, Irving was already an elite talent. 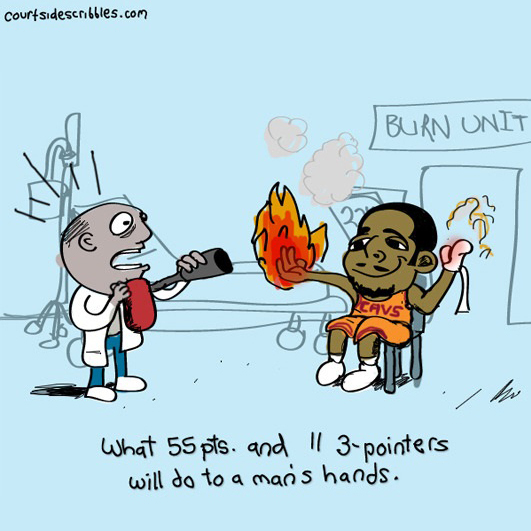 Irving is one of the greatest ball-handlers of all time, but many forget his incredible ability beyond the arc. He was even the youngest player to ever win the 3-point shootout. So after that night’s performance I couldn’t help but wonder how hot his hands must’ve felt! No doubt he paid a visit to the burn unit after slingin’ fireballs all night.